Sotheby’s will present The Line of Beauty: Drawings from the Collection of Howard and Saretta Barnet in a dedicated auction on 31 January 2018 in New York, highlighting Sotheby’s annual Masters Week sales. The superb collection of 28 drawings, formed over a period of some 40 years by the New York couple Howard and Saretta Barnet, is unique for its combination of small overall size, great chronological span and exceptionally high quality. Making their selections with razor-sharp aesthetic judgement, the Barnets very carefully assembled a group of drawings that tells the story of five centuries of the art of drawing in Western Europe, each of the very highest quality and beauty. Spanning from an early Renaissance landscape, drawn around 1500 by Fra Bartolommeo, to the rare and penetrating portrait of fellow-artist Balthus, drawn by Lucian Freud in 1989, the collection also includes magnificent drawings by the great 17th-century landscape master, Claude Lorrain, by the five top draughtsmen of 18th-century France and Italy (Watteau, Boucher, Fragonard, Tiepolo, Guardi), by the most visionary of Spanish artists, Goya and Picasso, and by two of the giants of 19th-century French art, Ingres and Degas. Despite being very different from each other in date, geographical origin, technique, style and function, these drawings reflect a powerful, consistent taste. The collection will be on view in our New York galleries from 26 – 31 January 2018, alongside our public exhibitions of Master Paintings. Fra Bartolommeo holds a distinct and distinguished position amongst the classic painters of the Renaissance. The present drawing, an exquisite and highly rare landscape drawing, depicting a View of Fiesole (estimate $600/800,000), has an absolutely impeccable provenance; given by Fra Bartolommeo to his fellow artist Fra Paolina da Pistoia, before subsequently entering the celebrated collection of the Florentine art historian Nicolo Gabburi. Dating to circa 1508, this drawing can be considered among the earliest pure landscape studies in European art and like the other surviving landscape studies by the artist, the majority of which are in museum collections, this sheet appears to have been drawn directly from nature. “Shepherds for an Adoration” on the recto and “Two putti among foliage” on the verso (estimate $300/500,000). The drawing also contains a charming musical score on the recto, perhaps explaining why it once belonged in the collection of Nicolas Lanière, who was appointed in 1618 as “Master of the Musick” to Prince Charles, who would later become King Charles I of England. Claude Lorrain’s The Valley Of The Aniene, Near Tivoli, With The Ruins Of The Aqua Anio Novus Aqueduct (estimate $600/800,000) has not been seen in public since it was exhibited at the Metropolitan Museum, New York, some 40 years ago, and the occasion of this sale therefore provides the first opportunity in a long generation to study and appreciate its exceptional qualities. Historically resonant, elegant in composition and understated in the handling of the media, it epitomises Claude’s accomplishments in the field of drawing, at a moment when he was riding a wave of critical acclaim and professional success. It is through serene and imposing drawings such as that cemented the artist’s position as the ultimate recorder of the landscape, ruins and atmosphere of the Roman Campagna. Though the monuments and antiquities of Rome itself and its immediate surroundings had been drawn and painted by other artists since the earlier 16th century, it was only when Claude took to the wider countryside surrounding the Eternal City in the 1620s that these pastoral locations began to be widely appreciated as subjects – a fashion that was subsequently to endure more or less unabated until the late 19th century. This characteristically atmospheric work is one of the finest and most significant drawings by the artist to remain in private hands, and is particularly fascinating in that it depicts an identifiable location, with the ruins of the Aqua Anio Novus Aqueduct still surviving to this day. In his relatively short-life, Jean Antoine Watteau managed to have a hugely significant impact on the development of Rococo art in France and beyond. A Scene From The Commedia dell'arte: A Girl Resisting The Advances Of A Comedian And An Actress Executing A Step (estimate $500/700,000) is an exquisite and extremely elegant drawing by the artist, depicting a scene from the “Commedia dell’Arte”, an early form of theatre, that originated in Italy in the 15th century. Spreading in popularity throughout Europe, it was of the utmost fashion in Rococo France by the 18th century. The two figures on the left, drawn predominantly in a vibrant red chalk, with touches of black lead, appear to depict the timeless scene of a beautiful woman, spurning 5the advances of an enthusiastic suitor. The equally beautiful woman on the right side of the sheet, does not seem to directly relate to the aforementioned narrative, but rather, appears to be an actress or dancer performing a step. The two groups of figures combined form a delightfully balanced “mis en page”, in which Watteau, captures both the elegance of the figures he portrays, coupled with an expressiveness and sense of movement that only a draughtsman of his immense virtuosity could achieve. Goya’s penetrating vision of humanity and intense visual imagination mark him out as one of the first truly modern artists. Throughout his life, he expressed his most private thoughts and feelings in his drawings, and gathered them at various stages of his career into eight remarkable "Private Albums". No Ilenas Tanto La Cesta (Don't Fill The Basket So Full)(estimate $1/1.5 million) originates from the Black Border Album, named for its most visible characteristic: the distinctive lines that frame each drawing within this group. Here the artist has portrayed an elderly woman, hunched over a basket of food, some of which has fallen on the ground to the right of her. Goya has added his own proverbial inscription to the lower centre of the drawing: No Ilenas tanto la cesta (Don’t fill the basket so full), to suggest that the viewer can learn from the mistakes made by the elderly woman depicted. The combination of media that Goya uses in this drawing remain in particularly exceptional condition, making this museum quality drawing one of the most important works by the artist to appear on the open market in recent years. Landscape With A Church, A Boat And Sheep (estimate $250/350,000) is a wonderful example, is executed in his visionary style. Drawn in Palmer’s characteristic combination of brown ink and wash with scratching out, the present work depicts a scene of rural bliss, with two shepherds and their flock bathed in dappled light, whilst behind them a boatman drifts past an idyllic village Church. 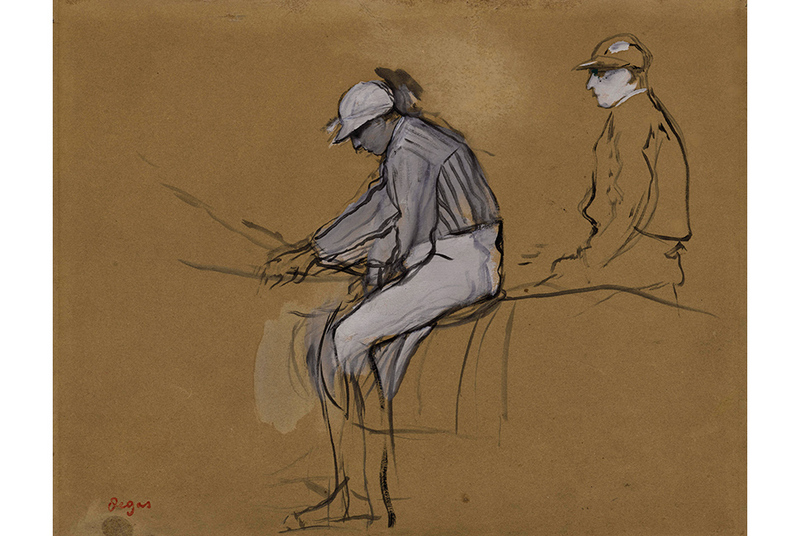 Edgar Degas, Deux Jockeys. Gouache and oil on paper; stamped lower left: Degas, 238 by 311 mm; 9⅜ by 12¼ in. Executed circa 1868-70. Estimate: 80,000 USD - 120,000 USD. Courtesy Sotheby’s. Deux jockeys (estimate $80/120,000) is a perfect example. Portrait of Balthus (estimate $70/90,000) magnificently illustrates the legendary British portraitist’s extraordinary powers of analysis in both form and character. Executed in 1989, the present work portrays Freud’s fellow artist Balthus, a French modern painter whose early investigation of figurative expressionism served as a significant influence upon Freud’s own iconic output. This drawing confidently captures the essence of the sitter, the brooding gaze and distinctive, shadowy features readily evoking Balthus’ reputation as a reclusive and impenetrable artistic figure. 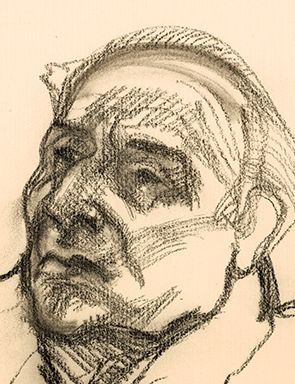 In each deft charcoal accent, Freud imbues his sitter’s refined visage with an arresting psychic intensity that serves as an enduring testament, both to Freud’s inimitable analysis of the human subject, and to his remarkable abilities as a master draughtsman.